A dental implant (also known as an endosseous implant or fixture) is a surgical component that interfaces with the bone of the jaw or skull to support a dental prosthesis such as a crown, bridge, denture, facial prosthesis or to act as an orthodontic anchor. The basis for modern dental implants is a biologic process called osseointegration, in which materials such as titanium form an intimate bond to bone. 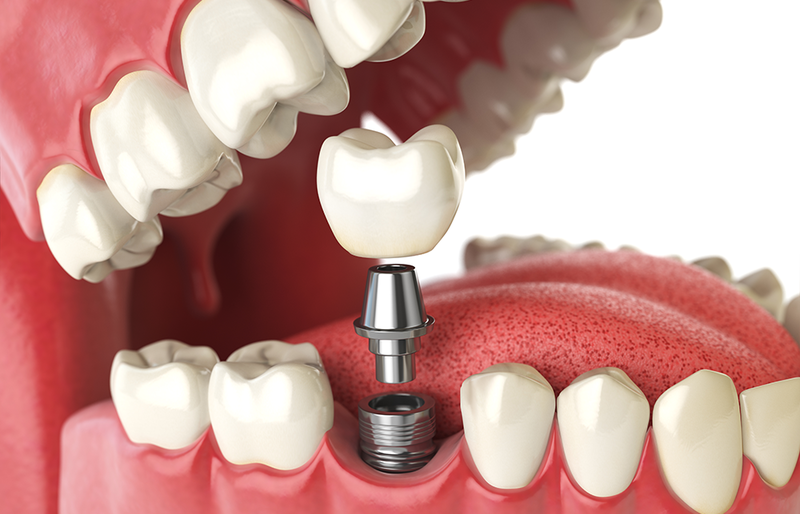 The implant fixture is first placed so that it is likely to osseointegrate, then a dental prosthetic is added. A variable amount of healing time is required for osseointegration before either the dental prosthetic (a tooth, bridge or denture) is attached to the implant or an abutment is placed which will hold a dental prosthetic. Success or failure of implants depends on the health of the person receiving the treatment, drugs which affect the chances of osseointegration, and the health of the tissues in the mouth. The amount of stress that will be put on the implant and fixture during normal function is also evaluated. Planning the position and number of implants is key to the long-term health of the prosthetic since biomechanical forces created during chewing can be significant. The position of implants is determined by the position and angle of adjacent teeth, by lab simulations or by using computed tomography with CAD/CAM simulations and surgical guides called stents. The prerequisites for long-term success of osseointegrated dental implants are healthy bone and gingiva. Since both can atrophy after tooth extraction, pre-prosthetic procedures such as sinus lifts or gingival grafts are sometimes required to recreate ideal bone and gingiva.